Welcome to the Day in the Life series, where you can get to know the volunteers and what they do every day in a more informal way! My name is Katherine Wong, the Monitoring and Evaluation Officer of Health Team. I decided to volunteer with CDI because I wanted to gain some fieldwork and real-life experience on how to conduct research. As a psychology student, it is very difficult for us to apply what we learn in university to real life, and I think CDI provides me with a unique opportunity to do so. I also enjoy the process of working on a project from scratch, follow it through and evaluate the impact of our work at the end of the summer. I think this will be a challenging yet rewarding journey, I am looking forward to the things we could achieve as a team! 8:30 – Wakeup / Breakfast – I usually skip breakfast or have a few Digestives before heading out for work. (Totally not because I wake up super late every morning because I value sleep over everything.) When I do have breakfast at the canteen, this is what it looks like, plus some Nutella which my friends kindly share with me. Plan and design sampling method for NCDs workshop, Then speak to the central M&E officer, Adi. There are currently two ongoing initiatives within the health team: emotional well-being and non-communicable diseases. For the emotional well-being project, we are collaborating with the Education team. I have been working closely with their M&E Officer for the past couple of weeks. Last week, we conducted our baseline survey with students from two different secondary school. We collected responses from a total of 114 students, and the survey consists of 18 questions, which means there are A LOT things to go through. You can probably tell from that pile of surveys, we are dealing with a relatively large set of data right here. Emotional well-being is a topic I am personally very passionate about, so this is very exciting for me! It would be pretty tough if I had to go through all the surveys alone, so here is Simina – the M&E officer from the Education team, and together we have successfully finished analysing all the surveys! Yay! Big shout-out to Simina for all her hard work despite the immense workload she is facing and thank you everyone on both the Health and Education team (Priyanka, Fatmah, Oliva, Florida, Nasma, Irene, Mahamudi) for going onsite to conduct these surveys and interviews. Also, a token of gratitude for all the Kite volunteers and our counterparts for translating the question and responses from Swahili to English, also for communicating with the schools – without you guys, none of this would have been possible. After a morning of hard work, finally it’s FOOD TIME!!! I usually have wali (rice) and makange (beef), alongside with some oranges and banana. Sometime if we’re lucky, we get spinach and even some maharage (beans) on the side! It is always nice to sit and chill out with my team and friends from other projects, especially hearing about what others are working on at the moment. Occasionally, we will have weird, philosophical discussion such as the nature of chicken as a continuous verse a discrete concept. Other times, we would have a heated debate about whether the beans they serve are peanuts or not. After lunch, I’ll be working on coding the teacher interviews from the schools we surveyed. I learned about qualitative analysis at university, but this is my first time actually doing it myself. In the emotional well-being initiative, all the qualitative data will be analysed using a bottom-up/data-driven approach. As there are no prior studies on student mental health in Tanzania, this makes it difficult for us to form theories prior to research. 17:30 – End of work! We usually have our daily briefing at 16:30, where we come together as a team and update each other on the things that we have been working on during the day, plus our progress so far. Here is a group photo of the health team! Today has been a very productive day – lot of work was completed, but I am exhausted. I will be working on more data analysis and drafting more surveys / interview question tomorrow. My days are generally quite different, as they really depends on the progress of the project. Some tasks might take days to finish, while others can be done within the hour. Although many may say that data analysis and drafting surveys seems to be quite dull, personally I find this quite exciting. It is exactly what I was hoping to do when I decided to volunteer with CDI. Through working on sensitive topics such as mental health and NCDs, CDI also made me become more mindful of cultural differences between different countries. Going through some of the responses we have collected from the surveys and interviews, there is often a sense of helplessness within me, but also an intense feeling of wanting to do more for the locals. Stepping back for a second, two months is a very short period and there are only a limited number of things which can be achieved. Yet in the face of this realisation, I still want to make the most of this summer, and hopefully, create some positive changes for various communities. Let’s end this blog post on a lighter note, here is a cute kitten outside my room, AWWW!! Our fifth video this summer looks at the Health Project’s focus upon community engagement. In addition to the research they have been conducting, the team have been running surveys and workshops in the informal settlement of Vingunguti, in order to raise awareness about the most common diseases in this community, and the methods of prevention against them, particularly in the area of women’s health. Please follow us on Facebook, Instagram and Twitter for more of the latest news! In collaboration with WaterScope (a Cambridge based organisation) and STICLab (a maker-space in Dar es Salaam), CDI are conducting field research upon a new 3D-printed microscope in order to bring cheaper, easier and more accurate malaria diagnosis to local communities in Tanzania. If you are interested in working with CDI, then please see http://www.cambridgedevelopment.org/get-involved – committee applications are NOW OPEN! 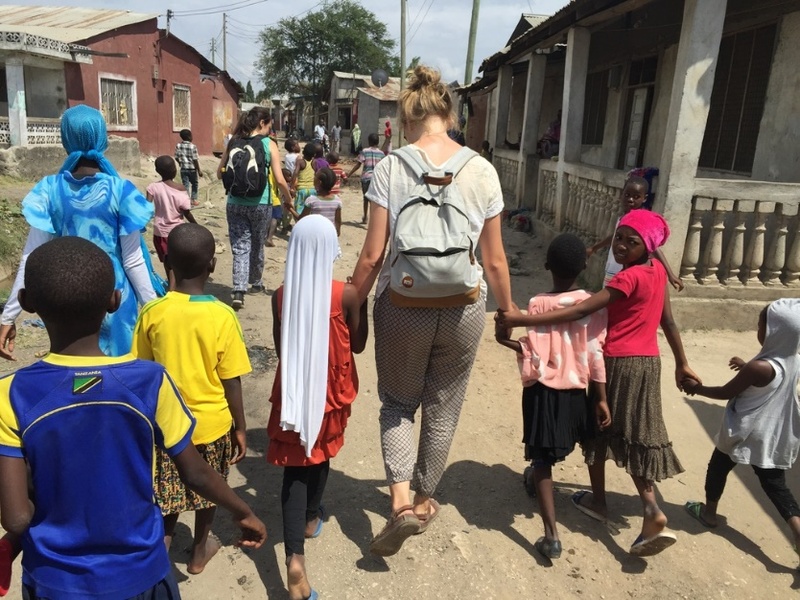 As part of the Innovation Team on CDI’s Health Project, Lisa Schomerus (left) is one of the volunteers researching the current healthcare system in Dar es Salaam, and engaging with members of the community to ascertain how CDI can best meet the demands of a growing population. Here, she highlights the importance of how, in seeking to improve the accessibility and affordability of healthcare products, the Health Project must carefully consider the balance between the current healthcare system and the habits and needs of the community. Added to this, many patients tend to visit health centres only at the latter stages of a disease when other treatments – including traditional practices or consultations with witch doctors – have failed. Moreover, these health centres and other healthcare providers are overflowing with capacity; even if the typical habits of the community were to change, the provision would struggle to accommodate them. Over the last two weeks, therefore, we have carried out two major pieces of primary research. Firstly, we approached the hospitals, dispensaries, pharmacies and health centres around Vingunguti to understand better the systems in place and the demographic of the population who use their services. Secondly, we have been conducting surveys in collaboration with the WaSH Project to assess the health-related habits and knowledge of the Vingunguti residents. As we now begin the process of evaluating our findings, we hope to establish the impact of the CDI-implemented latrine networks, which serve approximately 450 people, and to what extent this has improved the standards of sanitation in the community. Adjusting the Afya Yetu model to better improve health outcomes in Vingunguti – and for communities like Vingunguti, in the future – will not be straightforward. For one thing, each community is unique and uniquely challenging. In addition, the role of Afya Yetu in developing better health outcomes is nuanced, and can only be informed by research and experience. Continuing to engage with both the pre-existing healthcare systems in Dar es Salaam as well as community members themselves is one way of achieving this. It is through maintaining this dual communication that we hope to bridge the current gap between the established structures of healthcare and the reality of daily life in the informal settlements of Dar es Salaam. This was a weekend organized by the Kopfadeyemi Fellowship, held at the Google Campus. Our WaSH and Health Project Directors attended, and formed a team with other students from a variety of technical and scientific backgrounds, taking up the challenge of tackling the issue of non-communicable diseases in Africa. By the end of the conference, they proposed a solution of a mobile health system that empowers community health workers to tackle NCDs, aiming to initially set it up to combat diabetes in Tanzania and Kenya. It was a fantastic weekend for all involved, and our Project Directors particularly enjoyed being able to meet other students and discuss a variety of ideas and solutions as part of a wider team. Its day two under new leadership and possibly one of the busiest days for the health team. The following timeline recounts the day’s events, with approximate timings. Health Ambassador Product training from a charity called WAHECO. These are the ambassadors from the engineering’s network who we are bringing into Afya Yetu alongside the community health workers. This is followed by some video training on key diseases. Children’s hand washing sessions, joint with engineering, teaching around 100 children how to wash their hands effectively. This is run by a charity TAI. Community interviews to be done by our Tanzanian volunteers, to get opinions on Afya Yetu. 7:30 am. Team emerge to catch the Dalla Dalla into Vingunguti via some morning Chapatis (or in Jack’s case, 3 chapatis and 5 mandazi [giant dough balls], it’s a big day). 8:30 am. Arrival in Vingunguti, make it safely across the main road and head to ‘base 2’ aka the café. 8:45 am. Talk through the day. Plastic cups, condoms, sanitary pads and water are distributed to the right people as samples for the product training. 9:00 am. Jack has to print off more interview sheets as Natalie has forgotten to pick them up from her desk. 9:15 am. Nat and Sam go to the premises. Sam goes on to meet John from engineering to wait for TAI (who are running the children’s day) and sort out the location whilst Natalie waits for Juhudi from WAHECO (who are running the product training). John also goes to confirm the training with the health ambassadors. 9:30 am. John returns with the news that one of the health ambassadors has ‘gone away, may be back in a few weeks’. This is particularly bad news after hearing earlier in the week that none of the 8 community health workers could make the training either. 9:52 am. The Health ambassadors turn up to be trained, albeit in the wrong place. They are relocated to the right place. Somehow there are three of them after all which is a bonus! Meanwhile Natalie is still waiting for Juhudi, accompanied now by the local children, three of which are called Nadia. 9:56 am. Still no Juhudi, begin to search for her number to call. 10:12 am. Juhudi is “20 mins away’” The Health ambassadors are waiting in our premises. 10:20 am. Sam returns to the premises to drop the sample soap off (as we forgot earlier). 10:21 am. John arrives to show the Tanzanian students to the community interviews, however, they couldn’t leave until the training started so this was postponed until later in the day or next week. 10:40 am. Natalie leaves with Sam to go and meet the children to walk them over to the premises, leaving the Tanzanian students at the premises to greet Juhudi. Walking the children to the hand-washing session. 10:45 am. Jack has finished printing and takes over from Natalie to wait for Juhudi. 11.17 am. Decide to go ahead with the community interviews. 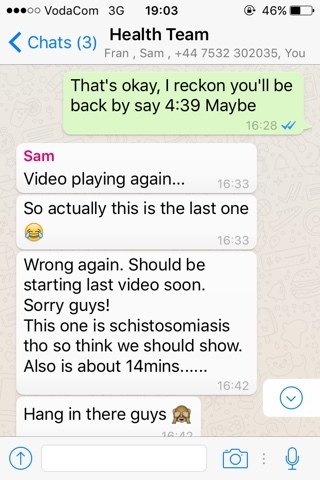 11.34 am. Juhudi arrives and training begins. 11:40 am. 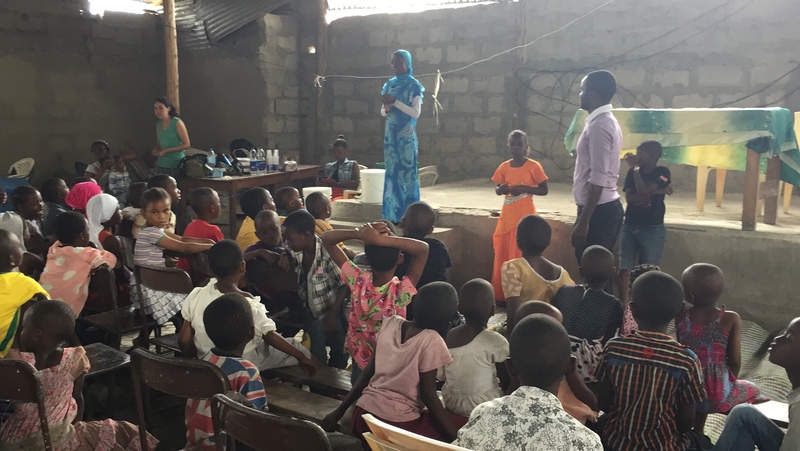 The children’s handwashing session is going well with the Tanzanian volunteers leading parts of the session and the children responding really positively. There is lots of singing and each child demonstrates and practises how to wash their hands. 12.47 am. The training was a big success and is coming to an end. 1:20 pm. The handwashing finished (only an hour late). Natalie and Sam head back to the café for lunch. 1:30 pm. The training actually finishes. 2:01 pm. The two groups head to the café for lunch. 2:02 pm. The café doesn’t do lunch on a Sunday. 2:05 pm. Food is outsourced and brought back to the café. 2:10 pm. Other people’s food turns up at the cafe, we may have misunderstood. 2:20 pm. Sam goes to get set up for the afternoon’s video training session. 2:45 pm. No sign of the trainees. Natalie and Carol go to find them and bring them back to the premises. 4:25 pm. Bets are placed on the finishing time of the session with the optimistic (Natalie) going for 4:39 pm and the pessimistic (Jack) going for 4:45pm. 4:39 pm. Natalie accepts defeat. 4:45 pm. The bets are abandoned. 4:46 pm. The playing cards come out. 5:00 pm. We begin to wonder what Fran’s contribution to the day has been, aside from keeping the chair warm in the Café. 5:05 pm. The videos finish and all that’s left to do is gather the contact details from the Health Ambassadors. 5:15 pm. We clamber into a Bajaji with some jack fruit (which, having never tried it before, caused much amusement among the locals as they had to show us how to eat it). 6:00 pm Arrive back at Ardhi with just enough light left to do some exercise on the field, with a few Tanzanian spectators and a lot of groaning. Written by Natalie Fisk, Volunteer on the Health Project.